dressed up like a lady: My ears are ringing. Went to an awesome show last night, where every band in the lineup was comprised at least partly of people who work at AMG, with me and MC. It was such a kickass time that I have not yet recovered enough to dump the pics of it from my camera, but I highly recommend checking out Cheat Sheet, the Opera House, and of course Gregoy McIntosh -- which features the trumpet prowess of my beloved MC. 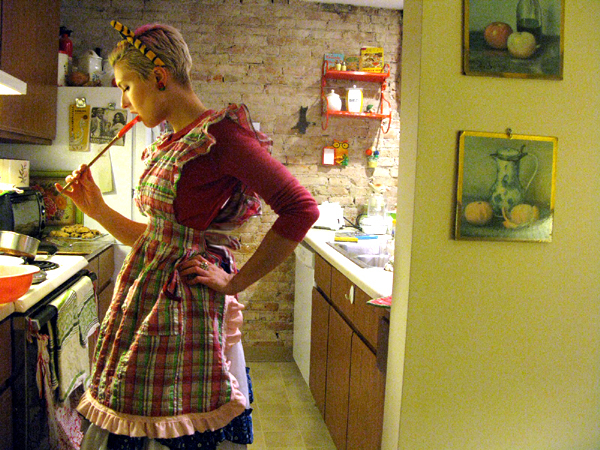 i think i might learn to cook if i had a sweet apron like that. maybe. I love all of the fun colors in your apron! It is an honor for me.